A West Hollywood homeowner's Halloween display depicts Alaska Gov. Sarah Palin dangling from a noose. 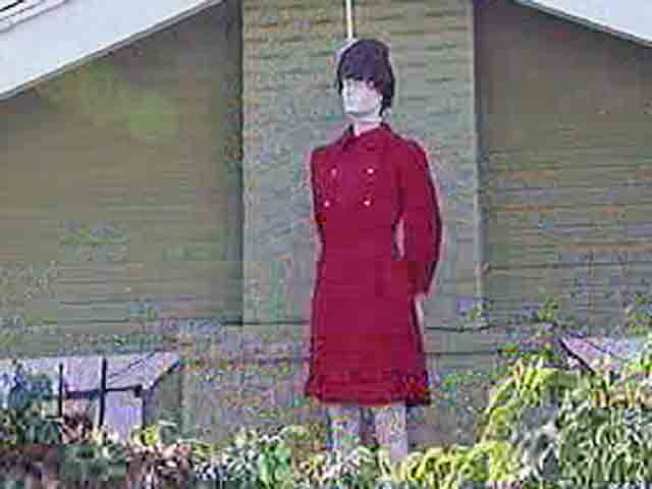 A Halloween themed effigy has generated several complaints because a mannequin -- dressed in vice presidential candidate Sarah Palin's trademark updo, glasses and a red business suit -- is hanging by the neck from a noose. Some concerned callers have reported the display as a hate crime so a special hate crime unit is investigating, West Hollywood Sheriff Sgt. Kristin Aloma said. The home also has an effigy of Republican presidential candidate, Sen. John McCain, popping out of a chimney surrounded by fake flames. Chad Michael Morisette, who lives in the house, said drivers and bus passengers have been stopping to snap pictures of the macabre scene. Morisette said if the noose scene had featured Democratic presential candidate Barack Obama, there might have been more outrage and maybe even vandalism to the home. Morisette said the effigy would be out of bounds at any other time of year, but "it's Halloween, it's time to be scary, it's time to be spooky."